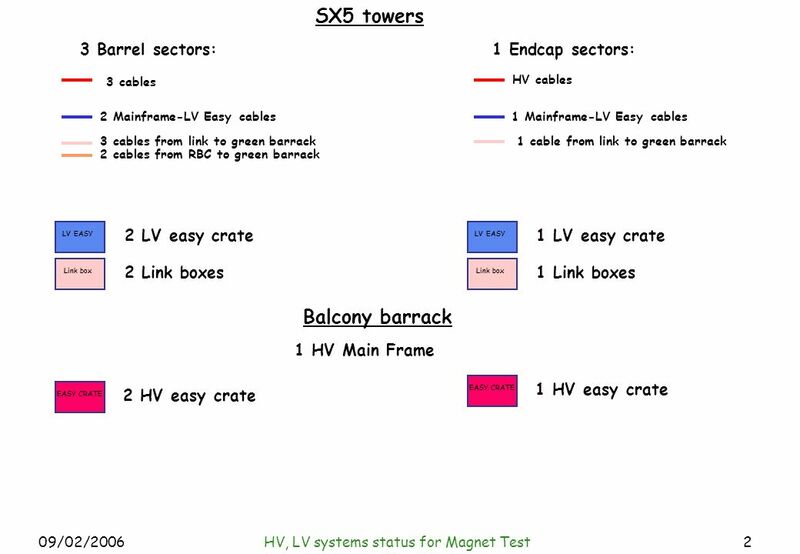 09/02/2006HV, LV systems status for Magnet Test1 Hardware needed for CC Green barrack Balcony barrack W+1W+2 Y+2 HV LV EASY link s10 s11 s10 380 V three-phase. 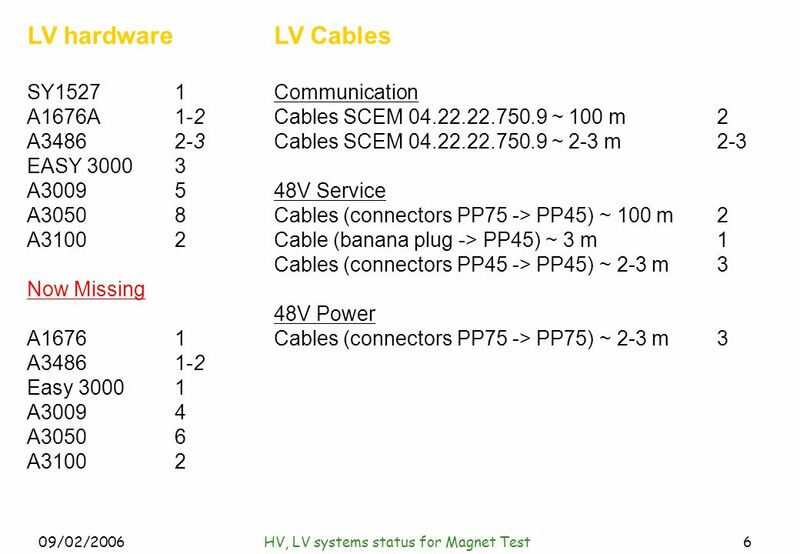 3 09/02/2006HV, LV systems status for Magnet Test3 A1676A1676 HV- x 4 Comm. 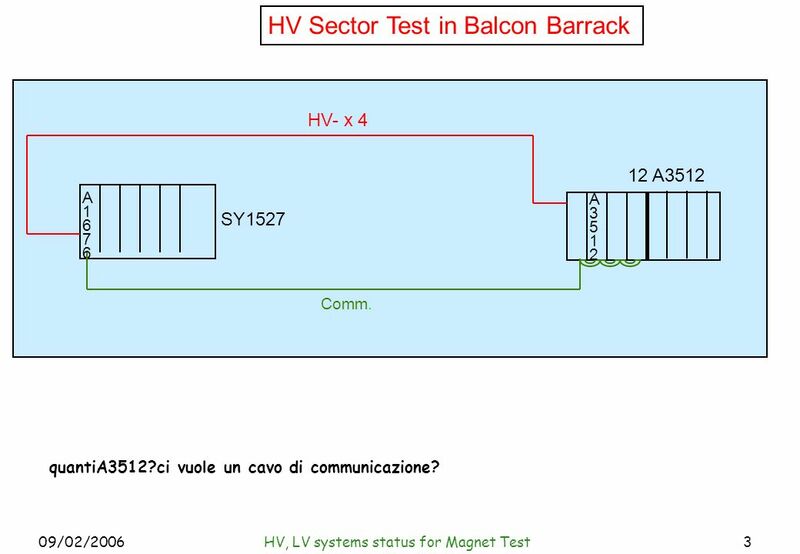 SY1527 HV Sector Test in Balcon Barrack 12 A3512 A3512A3512 quantiA3512?ci vuole un cavo di communicazione? 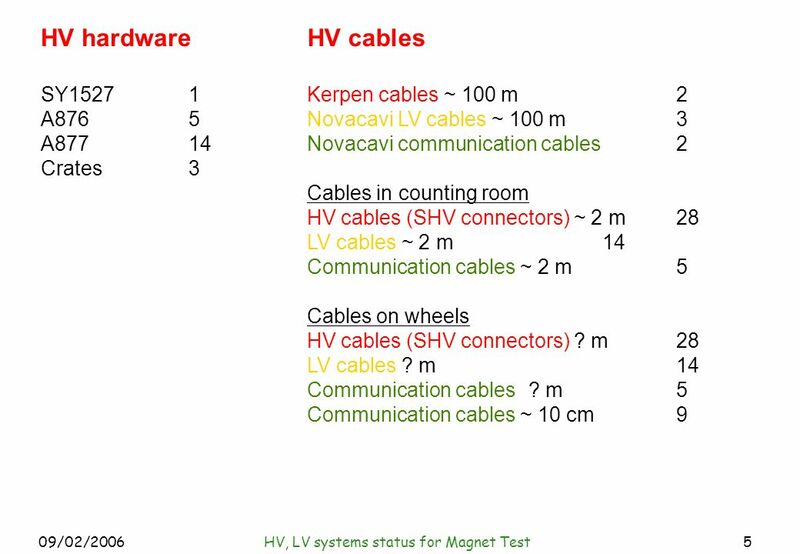 4 09/02/2006HV, LV systems status for Magnet Test4 A1676A1676 48 V Serv. Comm. 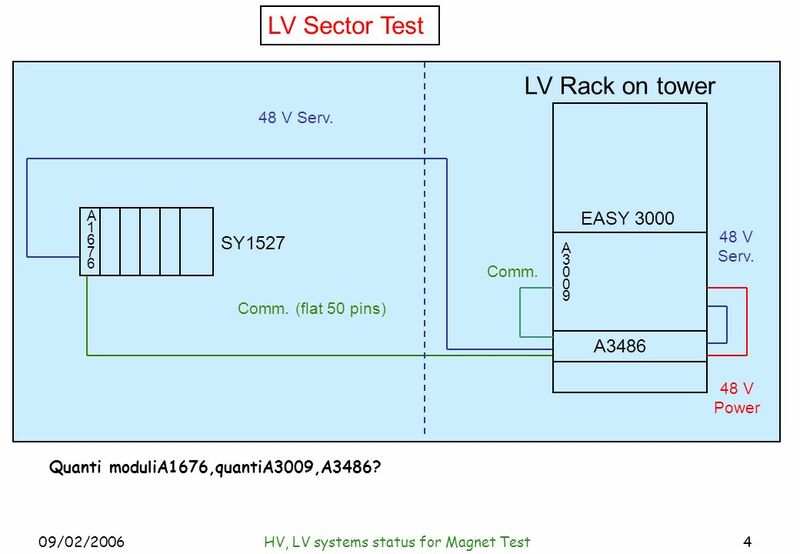 (flat 50 pins) SY1527 LV Sector Test LV Rack on tower A3486 EASY 3000 48 V Power 48 V Serv. Comm. A3009A3009 Quanti moduliA1676,quantiA3009,A3486? 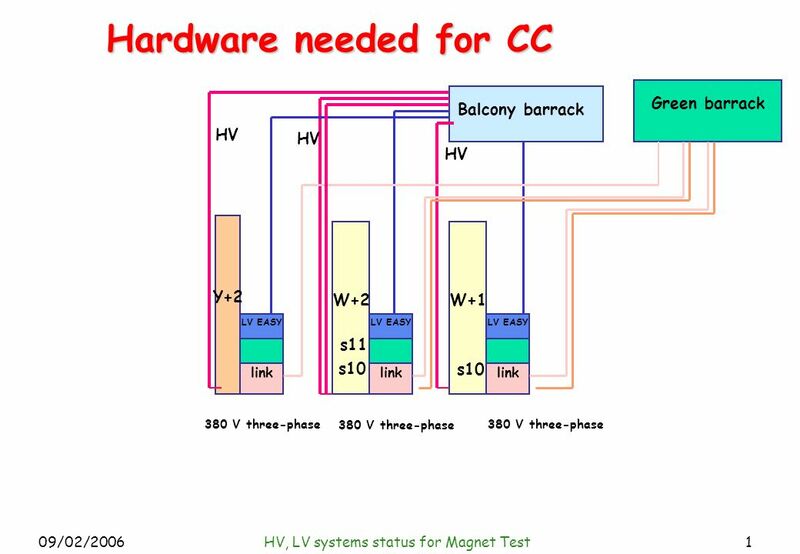 Download ppt "09/02/2006HV, LV systems status for Magnet Test1 Hardware needed for CC Green barrack Balcony barrack W+1W+2 Y+2 HV LV EASY link s10 s11 s10 380 V three-phase." ©EGEA 2006 Burda, WyploszMACROECONOMIA: UNA PROSPETTIVA EUROPEA Capitolo 9 LOfferta di Moneta e la Politica Monetaria. Davide Piccolo INFN Napoli Electronics Review Review of cable procurement and installation Davide Piccolo INFN Napoli. Place Value Ones, Tens, and Hundreds. Status of EC-C assembly at Liverpool C Buttar EC PAR, Nikhef Nov 04. Status of PMD DCS. PMD Layout Unit Module Super Module Converter + Support Plate Total channels Preshower+Veto = 221,184 8 Supermodules in 2 planes 48. PMD Layout Unit Module Super Module Converter + Support Plate Total channels Preshower+Veto = 221,184 8 Supermodules in 2 planes 48 Nos. Total Unit module. What Time Is It? Lesson by Mrs. Moody, FLE. M1M2 Students will develop an understanding of the measurement of time. a Tell time to the nearest hour and.